This article has new content coming soon from Halo: The Master Chief Collection, and may not be complete, confirmed or correct. Please update it as soon as any relevant and accurate material is available. There is more information available on this subject at Skull on the English Wikipedia. The Skull in Halo: Reach. The skull is a bony structure in the head of many creatures that supports the structures of the face and protects the brain from injury. It is composed of two parts, the cranium and the mandible. Human skulls have several meanings, with the most widespread one representing death and mortality. Skulls were introduced as gameplay-modifying in-game items in Halo 2. Skulls featured in Halo 2 are more like easter eggs than actual features—although they do affect gameplay dynamically, they are hidden and not entirely well-known to every player, and not essential to a campaign's gameplay experience. Once a skull is found in Halo 2, it can be wielded as a melee weapon, but does the same amount of damage a normal melee with a standard weapon would do (excluding the fatality of a sword lunge). There are two skulls in every level other than the level Delta Halo. Skulls in Halo 3 are hidden throughout the campaign as they are in Halo 2, but are separated into two different types (silver and gold) and are incorporated into gameplay as score multipliers. Gold skulls represent skulls that amplify and modify scores in campaign levels, and silver skulls represent those that change the game in humorous ways, except for the Blind Skull which changes the dynamics of the player's HUD. Both silver and gold skulls augment the player's score throughout the campaign. Once a skull is found, it can be wielded as a melee weapon just as it could in Halo 2. Skulls are only found on the Normal, Heroic, and Legendary difficulties. Finding all skulls will unlock the Hayabusa armor permutation. 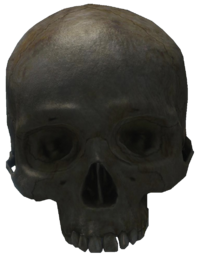 Skulls are also featured in Halo 3: ODST in both campaign and multiplayer (Firefight remains the sole multiplayer function for ODST), and are separated into gold and silver as they were in Halo 3. The skulls in ODST remain the same in concept, name, and function as they were in Halo 3, but are not hidden in campaign levels as they were in the previous installments. Skulls can be activated in a special menu before the game starts, similar to Halo 3, and also feature the separation of skulls into both gold and silver types that function almost the same as they did in Halo 3. Gold skulls modify score, and silver skulls only modify the game itself in humorous ways — both of which retain the names, design, and properties as they did in Halo 3. In Halo Wars skulls are more numerous than they are in any other Halo game, and retain similar properties of the previous games, while adding new functions and types as well. Specifically skulls are not separated into gold and silver, and are activated by completing certain specific optional objectives in certain missions. Once the objectives are completed, the skull will be unlocked, and must be found in a specific location before the mission ends, giving them a similarity to their location in other Halo games in that they must be "found" in a certain specific area. Skulls required to be found and claimed in campaign returns in Halo: Combat Evolved Anniversary. Since 343 Industries wanted to preserve the original Halo: Combat Evolved experience, most of these skulls will not change gameplay dramatically. Due to this, only a few skulls featured in previous games have returned, and most of the newly-introduced skulls do not alter the core gameplay. Just like the new Terminals, skulls and their effects do not appear in Classic mode. In the Oddball multiplayer gametype, the skull is an item that must be located and in possession for the longest time possible. While carrying the skull, it temporary replaces the previous weapon the player was using. The skull cannot be holstered, but can be used as a very efficient melee weapon. Depending on the rules of the variant, the skull can deal much more damage than a normal melee would. Oddball is featured in Halo: Combat Evolved, Halo 2, and Halo 3 multiplayer. The skulls are not featured in multiplayer in Halo Wars. In the default settings for Oddball in Halo 3, a successful skull melee can cause an instant kill. The six new multiplayer maps included in the Mythic Map Pack each have skulls in them and claiming each of them will award the player the respective achievement. Unlike the skulls in campaign, the skulls can only be found in Forge, and claiming these skulls will not result in any gameplay change. Claiming all of these skulls will award the player the "Vidmaster Challenge: Brainpan" achievement. In Halo 3: ODST's Firefight, skulls are activated as the game progresses chronologically in terms of waves and rounds. Every round a different skull activates, ensuring a certain level of difficulty (and score modification) depending on the function of the skull itself. Skulls are separated into both gold and silver in Firefight as well, and the silver skulls can be turned on via a special menu before the game starts. The skull also appears in Halo: Reach's multiplayer Headhunter gametype as multiple flaming skulls. In Headhunter, players fight for flaming skulls which are dropped when an opposing player is killed, and then return the collected skulls to their designated (but mobile) deposit zone. Players will be able to collect the exact numerical bounty which the previous player has collected; i.e. a player who has seven skulls will drop all seven skulls when killed. An interactive counter will be visible in a player's HUD depicting the exact amount of skulls each opponent is carrying. Also, in Halo: Reach's far more dynamic implementation of Firefight, players will be able to completely customize and create their own Skulls (integrated parameters set for certain conditions, such as damage, player speed, and AI enemy strength) to be incorporated in custom matches. The in-game model of the skull itself is from Halo: Combat Evolved's early development: when the player goes to rescue Captain Jacob Keyes in the level Keyes and discovers that he has been consumed by the Flood, the Master Chief was to burn through the Proto-Gravemind biomass and pull out Keyes' skull to get his neural implants. However, this was cut due to the Flamethrower being removed and likely because the burnt skull was too disconcerting to present in the game as well. Lorraine McLees was originally tasked with designing the burnt skull. Other Bungie members claimed that she had done her job so well that "the skull was so gruesome no one could look at it." The Elite skull was used as an indicator for Legendary difficulty settings in the Halo Trilogy and Halo: Reach. The Legendary difficulty icon was changed to that of a human skull in Halo 3: ODST, and later a Promethean one in Halo 4. In Halo 2, the Blind Skull can be used to make the player's weapon and Heads-Up-Display disappear. A Command Neural Interface resembling that of Captain Keyes, can be seen on the base of the skull. In the Halo 3 campaign level Cortana, several lightly rendered Brute skulls can be seen littering the ground of the Flood-infested High Charity, along with several arm and leg bones. The skulls can be seen in better detail if the player kneels down and looks closely. The skull of a Brute as seen in the Halo 3 campaign level Cortana. The skull as it appears in Halo: Combat Evolved. The skull as it appears in Halo 3. The skull with a Neural interface. The Elite skull featured for Legendary difficulty in the Halo Trilogy. A silver skull from Halo 3. A gold skull from Halo 3. A skull featured on the Legendary Alone completion achievement in Halo: Reach. Grunt funeral skull in Halo: Combat Evolved Anniversary. The Hollow skull from Halo: Spartan Assault. A Skull as seen in Halo 5: Guardians.